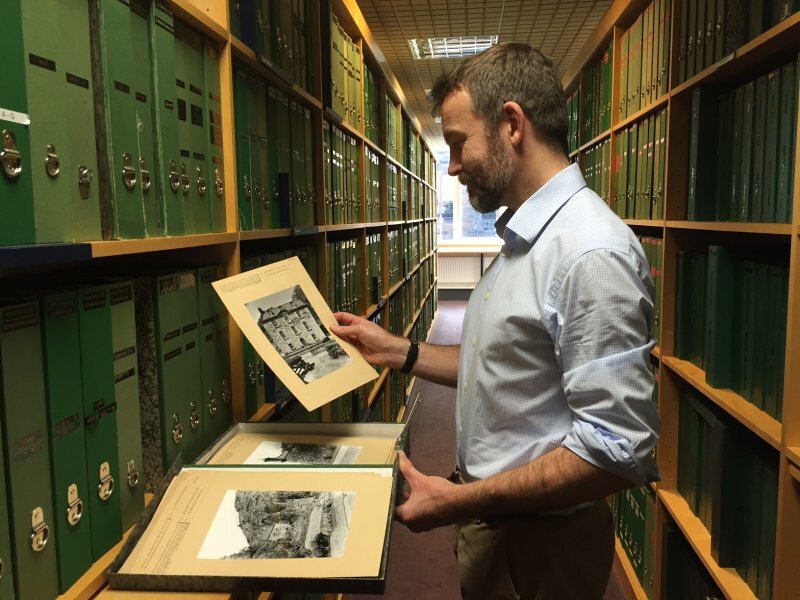 You can visit our Search Room to consult original archive and collections material. Entrance is free and you can browse open access items such as books and photographs. If you would like to see original historic drawings and manuscripts, add these items to your "Search room basket", make an appointment and we will have the material awaiting your arrival (up to 10 items). Please await for confimation of the date and time of your visit before setting out to avoid disappointment. Alternatively, you can request up to five items from our stores on the day. Items are retrieved twice a day, at 10.30am and 2pm. Alternatively make a note of the Catalgue Number(s) of the items you wish to see and contact us on +44 (0)131 662 1456 or fill out the Search Room Booking Request form to make an appointment. We welcome visits by groups. These are free and must be pre-booked via the Search Room Booking Request online form. You will be given an introduction to our work, a tour of the Collections and Search Room and a demonstration of our on-line resources. Let us know if the group has a particular focus or access needs and we will tailor the tour as required. Group visits last approximately 1.5 hours. Monday is set aside for group visits but we are also able to accommodate small groups (up to 15 people) during opening hours between Tuesday and Friday. We provide a range of copying facilities in the Search Room and permit self-copying (cameras or phones) of certain material. We can also offer high quality professional digitisation and printing. John Sinclair House, 16 Bernard Terrace, Edinburgh EH8 9NX. The Search Room is on the first floor and is fully accessible for visitors with disabilities. Bernard Terrace is located off South Clerk Street in Newington, Edinburgh and is served by a number of buses. Limited car parking is available for visitors to the rear of the building.